Do you live in a city? Do you reflect on how it makes you feel? I do. I’m actually doing my PhD in cognitive neuroscience examining that exact topic. I chose to spend 5 years in grad school exploring this issue because of my frontline work as a mental health occupational therapist. Occupational therapists look at how someone’s environment influences how they feel and function; the more time I spent working with people with mental health issues in cities, the more I began to wonder how it was that the built environment of the city impacted their wellbeing. I saw urban design as an issue of public health. To explore this question, I expose research participants to virtual environments of cities and measure their psychological and physiological responses. The idea is to get an understanding of how the built environment of a city can influence our mood. While VR is pretty cool, I recognize its limitations to study this issue, so I also do “real world” research. 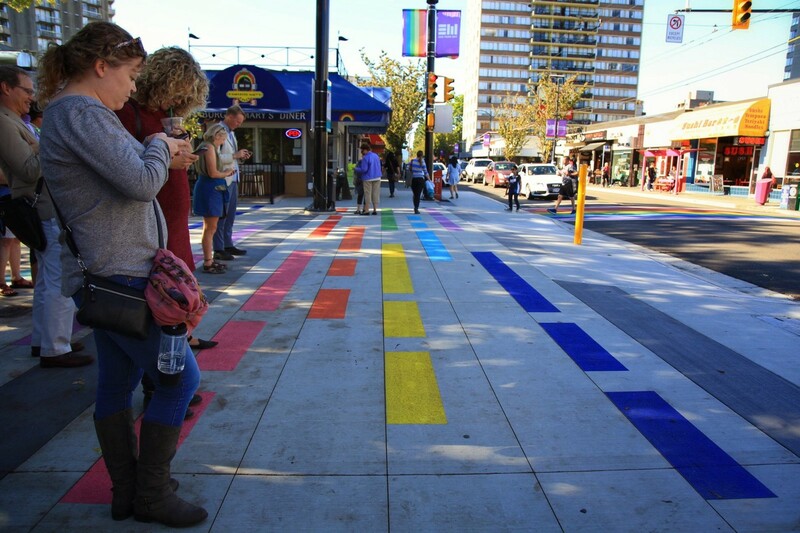 What we found was that people were happier at the rainbow crosswalk and the green back alley, than they were at their respective pairings. You can read more of our results in our recently published paper here. I know you might be thinking, “so what?”. What I think is fascinating about our findings is that these very simple interventions produced a significant effect on happiness. This is something to reflect on as the world continues to urbanize. More than half the world lives in cities, and that number is only going to grow. Furthermore, research has shown that mental illness is more prevalent in cities. Our findings suggest that simple and affordable interventions, like paint and shrubbery, can make people happy, and perhaps even give them something to smile about. Even better, citizens, in collaboration with their cities, can go out and make these changes to their communities themselves. Building happy cities doesn’t need to involve a lot of money, or world-class architectural expertise for that matter. Some colour and some greenery can go a long way. As our cities continue to expand, it’s extremely important that we consider these simple interventions. Our wellbeing, and the health of generations to come, depends on it.